[375 Pages Report] The global mHealth solutions market is projected to reach USD 90.49 Billion by 2022 from USD 21.17 Billion in 2017, at a CAGR of 33.7%. The growth of the mHealth solutions market can be attributed to the factors such as the growing demand for healthcare applications, the advent of advanced connectivity and network technologies, robust penetration of 3G and 4G networks to provide uninterrupted healthcare services, and rising focus on patient-centric healthcare. Top-down and bottom-up approaches were used to validate the size of the global mHealth solutions market and estimate the size of various other dependent submarkets. Major players in the mHealth solutions market were identified through secondary sources secondary sources; directories; databases such as Hoovers, Bloomberg Businessweek, Factiva, and OneSource, journals and associations such as American Health Information Management Association, Ohio Health Information Management Association and their market revenues were determined through primary and secondary research. Secondary research included the study of the annual and financial reports of top mHealth solutions market players, whereas primary research included extensive interviews with the key opinion leaders such as CEOs, directors, and marketing executives. The percentage splits, shares, and breakdowns of the product markets were determined using secondary sources and verified through primary sources. All possible parameters that affect the mHealth solutions market covered in this research study have been accounted for, viewed in extensive detail, verified through primary research, and analyzed to get the final quantitative and qualitative data. 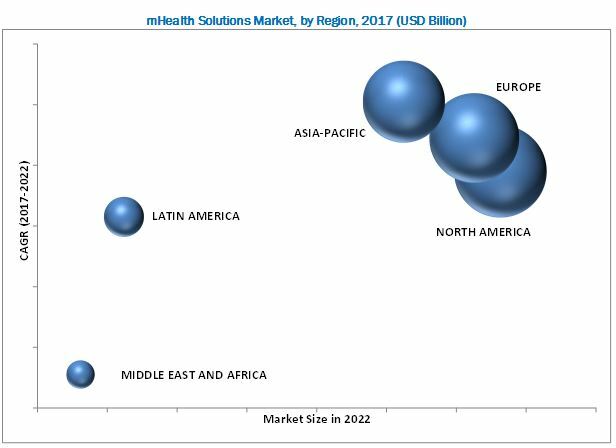 This data is consolidated and added with detailed inputs and analysis from MarketsandMarkets and presented in this mHealth solutions market report. The global mHealth solutions market is consolidated in nature with the top three players, namely, Medtronic plc (Ireland), Koninklijke Philips N.V. (Netherlands), and Omron Corporation (U.S.). The other leading players in this market include Apple, Inc. (U.S.), AirStrip Technologies (U.S.), AliveCor, Inc. (U.S.), LifeWatch AG (Switzerland), Withings (France), BioTelemetry Inc. (U.S.), athenahealth, Inc. (U.S.), AgaMatrix, Inc. (U.S.), iHealth Lab, Inc. (U.S.), AT&T (U.S.), Cerner Corporation (U.S.), Cisco Systems, Inc. (U.S.), and Nokia Corporation (Finland). The mHealth solutions market has numerous small players operating at both global and regional levels as well. Some of the other players in this mHealth solutions market include Jawbone (U.S.), Fitbit (U.S.), Nike Inc. (U.S.), Qualcomm (U.S.), and Dexcom, Inc. (US). The leading players are continuously developing new and innovative products to maintain their shares in the mHealth solutions market. The global mHealth solutions market is projected to reach USD 90.49 Billion by 2022 at a CAGR of 33.7% during the forecast period. The growth of the mHealth Solutions market can be attributed to the penetration of smart gadgets, increasing utilization of connected medical devices for remote monitoring and mHealth apps in the management of chronic diseases. Also, factors such as the advent of advanced connectivity and network technologies, robust penetration of 3G and 4G networks to provide uninterrupted healthcare services, and rising focus on patient-centric healthcare are expected to drive the growth of the mHealth Solutions market during the forecast period. The mHealth solutions market in this report is segmented on the basis of by product and services available in this market. mHealth solutions Market report also provides market information on major regional segments, namely, North America, Europe, Asia-Pacific, and the Rest of the World. Based on product and service, the connected medical device segment dominated the mHealth product and service market in 2016. The mHealth solutions market growth can be attributed to the shifting consumer preferences towards a healthier lifestyle, need for continuous monitoring of various chronic health conditions of patients, and the need to overcome the financial burden on the caregivers. The mHealth applications market is segmented into healthcare applications (designed for patients) by activity, and medical applications (designed for professionals). The healthcare applications market is expected to register the highest CAGR during the forecast period. This growth is attributed to the increasing prevalence of chronic conditions, and lifestyle related diseases. Bases on mHealth services, the mHealth Solutions market is categorized into remote monitoring, diagnosis services, treatment services, consultation services, fitness and wellness services, prevention services and healthcare system strengthening services. In 2016, remote monitoring services accounted for the largest share of the global mHealth services market. The large share can be attributed to the increasing adoption of remote monitoring solutions by patients in remote rural areas and technological advancements in medicine and telecommunication. In 2016, North America dominated the global mHealth solutions market. The high penetration of mobile devices, the development and adoption of innovative technologies, improving consumer accessibility to connected medical devices, and the presence of major companies in this region are driving the growth of the mHealth solutions market in this region. Asia-Pacific is the fastest-growing market for mHealth solutions. The growth of the mHealth solutions market across the Asia-Pacific region is primarily driven by the escalating demand to reduce the burden of the healthcare systems, curtail healthcare delivery costs, rising geriatric population and the demand for better healthcare services, and the various government initiatives for enabling efficient, affordable, and on-time delivery of quality care. Weak reimbursement coverage, low guidance from physicians in selecting apps, and reluctance to use advanced solutions by traditional healthcare providers are likely to hinder the growth of the mHealth solutions market to some extent. The players in the mHealth solutions market include Medtronic plc (Ireland), Apple, Inc. (US), AirStrip Technologies (US), AliveCor, Inc. (US), Nike Inc. (US), Koninklijke Philips N.V. (Netherlands), Jawbone (US), OMRON Corporation (Japan), Withings (France), BioTelemetry Inc. (US), athenahealth, Inc. (US), AgaMatrix, Inc. (US), iHealth Lab Inc. (US), AT&T (US), Qualcomm (US), Cerner Corporation (US), and Cisco Systems, Inc. (US), Agamatrix Inc. (US) and Nokia Corporation (Finland).